From humble beginnings in 1988 Brian Cummins Group has positioned itself as a supplier of quality retail display equipment, custom joinery and building services to the Australian Retail industry. 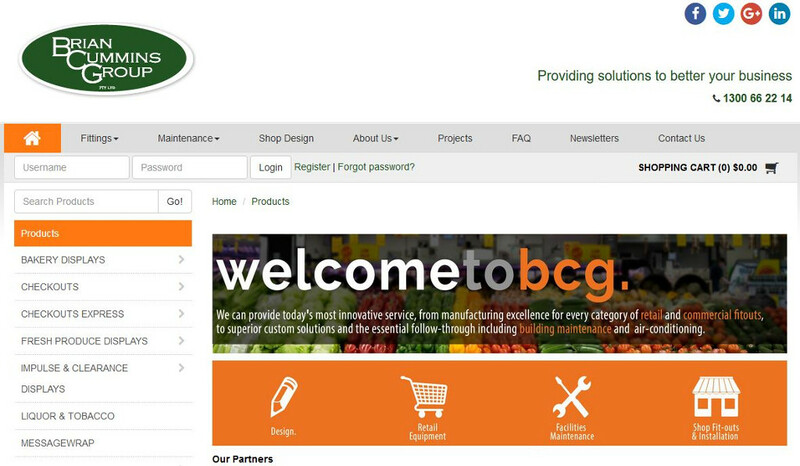 Specialising in the supermarket and FMCG market; Brian Cummins Group continues to be one of the last remaining privately Australian owned, operated organisations still manufacturing supermarket equipment in Australia. "Our Straightsell eCommerce website sits parallel to our primary website, although its design offers seamless transition between the two websites; this allows us to offer one site for marketing and the other for online purchasing without our customers recognising the change. With seamless integration to MYOB EXO Business, our inventory is almost immediately updated when an order is placed online, so customers have access to accurate stock levels, account holders also have access to preferential pricing once signed in, and the payment automation saves time with order processing. This is our second website with Straightsell, we are extremely excited to now offer our clients a mobile responsive site."